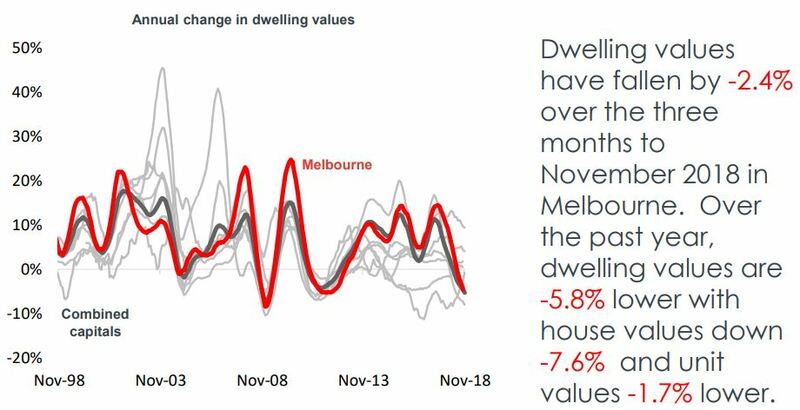 While Melbourne property values are declining, it’s not all bad new; dwelling values remain significantly higher than they were five years ago and the recent declines have provided an improvement to housing affordability. So…is it too late to get into the Melbourne property market? While some areas still have strong growth ahead, certain sub markets should be avoided like the plague. I’m going to examine the many factors that are driving Melbourne’s various property markets in detail in this blog which is a little longer than normal, so if you’re looking for a particular element of the Melbourne property market, use these links to skip down the page. Record international and interstate migration will continue. 1,500 new households are being formed in Melbourne each week and the supply of new housing is struggling to keep up with this burgeoning demand. Melbourne’s rental market is tightening, with low vacancy rates and rising rentals. 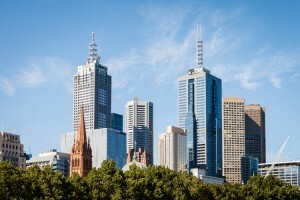 What types of properties perform well in Melbourne? How do Melbourne’s areas compare? How do I choose an investment property in Melbourne? How can I keep up with the market? Currently some markets are still hot, while others are not. 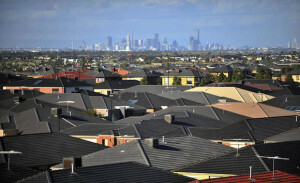 Over the past couple of years Melbourne home values have risen at the second fastest pace of all capital cities. Auction clearance rates have consistently been high and discounting and time on market levels have fallen across the city over the year showing strong market depth from a range of home buyers and investors. 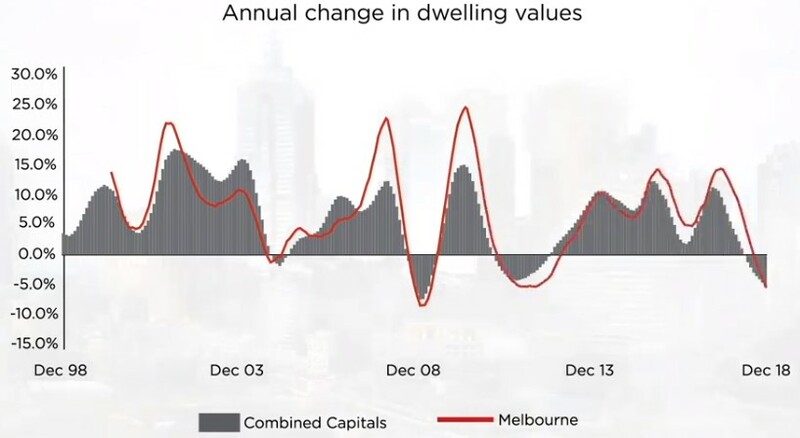 While future capital growth will be a little slowly than in the last few years, Melbourne’s property prices will continue to be underpinned by its strong population growth and the influx of 35% of all overseas migrants. 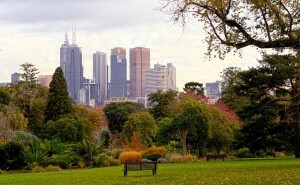 At the time of this update of this article – January 2019 – the decline in Melbourne dwelling values is concentrated across the most expensive end of the market, with dwelling values down 9.9% over the past twelve month across the top quartile of the market, while the most affordable quarter of the market has actually seen values post a rise of 1.7%. A similar trend can be seen across the sub-regions comprising Melbourne. The prestigious Inner East of the city has seen value drop 11.9% over the past twelve months while the slightest falls have been in the West and along the Mornington Peninsula. Although value growth has slowed rapidly over the past year in Melbourne, regional Vic continues to see comparatively stronger growth, driven by housing being much more affordable than it is in Melbourne. To help you understand what’s ahead for Melbourne property I’m going to provide you with a lot of detail but the bottom line is – everyone is coming to Melbourne and they’re looking for somewhere to live. In other words we’re not building enough houses and that’s what’s driving Melbourne property prices. Historically, the city’s property market has gone from strength to strength. In 1966, the median house price in Melbourne was just $9,400. Values have doubled more than six times since then, with the median crashing through the $100,000 barrier in 1988, and pushing through the half-million dollar mark in 2010. 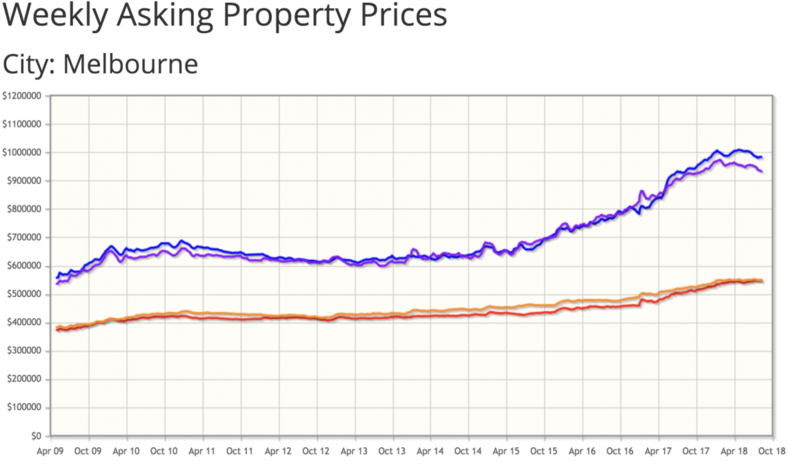 However dwelling price growth in Melbourne has been very fragmented. While some suburbs has just chugged along others are strongly outperforming. Many inner south eastern, more affluent suburbs have well outperformed these averages. In particular suburbs property prices for homes within top Victorian government school enrolment zones have rocketed up to 32 per cent over the past year. While over the long term rentals have grown in line with property values, more recently rental growth has remained moderate. 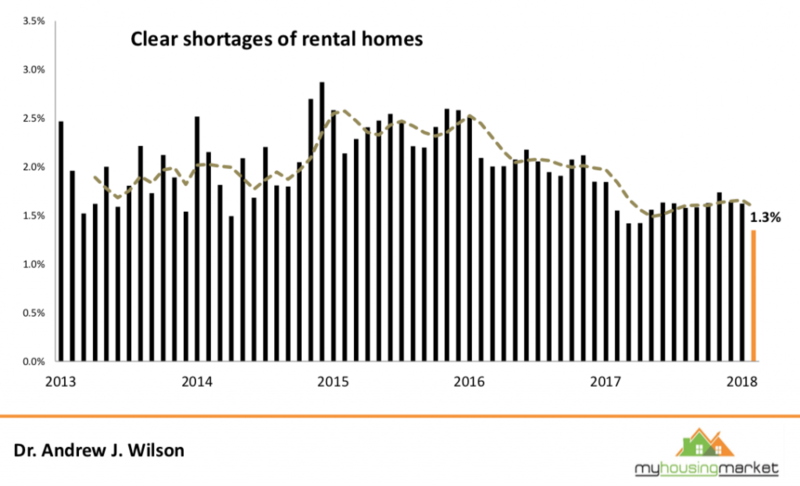 But things are slowly changing and now a shortage of rental properties at a time of strong and increasing demand means the Melbourne rental market is tightening with vacancy rates falling and rents slowly rising. As Australia’s second-largest city, Melbourne is home to around 4.82 million people which accounts for 19.05% of national population. Melbourne is Victoria’s business, administrative, cultural and recreational hub of the state. On an average day around 854 ,000 people use the city, and each year Melbourne hosts over a million international visitors. The culturally diverse and creative city is home to residents from an estimated 180 countries, who speak over 233 languages and dialects and follow more than 100 religious faiths. Of the 130,000-odd thousand people who live in Melbourne’s inner city (the CBD), more than half are aged between 15 and 34, and they are generally living in single-person households or as couples without children. According to Census data, this is strongly influenced by the high number of higher education students (both domestic and international) that reside in the city. Immigration from China and India accounted for 32% of overall growth in population numbers, making Mandarin the second most commonly spoken language in the city. A well-planned city that is amply serviced by a range of public transport options, Melbourne is laid out under the ‘Hoddle Grid’, so named after its designer Robert Hoddle, which runs roughly parallel to the Yarra River. As with most large cities, greater Melbourne is divided into ‘east’ and ‘west’ neighbourhoods; those in the east are more established and generally considered more affluent, while those in the west are more affordable, newer suburbs with less established reputations. 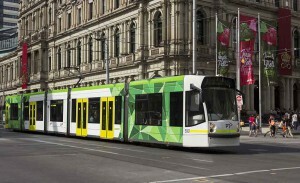 Melbourne residents enjoy the use of some of Australia’s most advanced and well-connected systems of road, rail and tram infrastructure, which give locals plentiful options when deciding how to get around the city and its surrounding suburbs. The city received a perfect score of 100 for its world-class infrastructure in the 2013 EIU Liveability Report, where ongoing investment in Melbourne’s infrastructure was highlighted as being one of the factors that keeps Melbourne at the top of the index. And the State government is spending a lot on infrastructure recognising that good infrastructure is not an end in itself, but an enabler of better social, economic and environmental outcomes. Meanwhile, Melbourne Airport handles more than 30 million passengers annually along with 350,000 tonnes of air freight, making it Australia’s largest air freight hub. The city is also home to a number of world-renowned universities. However as Melbourne suburbs sprawl further and further out from the CBD, the difference in level of amenities between the inner suburbs and the poorly serviced outer suburbs is becoming more glaring, causing people to pay a premium to leave closer to the CBD and the better serviced inner suburbs. As a cosmopolitan, creative city that is served by a number of industries, Melbourne residents enjoy employment in diverse industries, from tourism, hospitality and entertainment to commerce, industry and trade. Almost half the jobs created in Australia over the last decade have been created in Melbourne and Sydney. Over the last 10 years more than 500,000 new jobs were created in Melbourne as Victoria is transitioning from a manufacturing state to one driven by service industries, which is creating strong job growth and resultant overseas and interstate migration. The unemployment rate in Victoria has fallen substantially over the past year. Vic’s trend unemployment rate was recorded at 5.5% in June 2018 which was down from 6.1% a year earlier. Vic has created 64,000 jobs over the 12 months to June 2018. Based on the 64,000 jobs created over the past year, total employment has increased by 2.0% and 20.0% of all jobs created nationally last year were in Vic. Victoria remains the nation’s population growth powerhouse but growth has started to slow a little. Melbourne’s population now stands at over 5 million people and Melbourne is still the fastest-growing cities in the country, growing at around 2.4% per annum. Think about that… this means Melbourne’s population will increase by around 10% over the next 4 years or so! Looking at the components, the 143,420 person population increase was comprised of 42,312 from natural increase, 84,722 persons from net overseas migration and 16,386 persons from net interstate migration. While natural increase was at an historic high level, net overseas migration was the lowest it’s been since September 2016 and net interstate migration has been falling for three consecutive quarters and is the lowest it’s been since March 2016. As you can see from the graph below, more than three quarters of net overseas migration has been into NSW and Victoria, most of this coming from China and India. Most of these permanent migrants are coming for jobs and are of household formation age. Many initially rent the homes, but many want to eventually buy a home as part of their “status” of being an Australian. A large chunk of this population growth is happening in Melbourne’s outer west, where the number of residents has increased by a figure equal to the population of Hobart over the last decade. In fact, seven of the country’s top 10 growth areas were outer suburbs of Greater Melbourne, with international migration a big driving force behind Melbourne’s population growth. Just because there is significant population growth in these areas doesn’t mean there is strong capital growth of property values in these areas. Melbourne is set to overtake Sydney and become Australia’s largest city by the 2030’s according to demographer Bernard Salt. And that’s not really that far away, is it? If these forecasts pan out, and they are likely to be correct, they will underpin the strength of the Melbourne property market and deliver surety to investors who own property in the right locations. Melbourne offers what Sydney cannot or will not offer: access to affordable housing on the urban fringe. Melbourne planned for growth from the Kennett years resulting in the formation of a plan for five million residents at 2030 and announced in 2002. Either way, Sydney’s lead is now closer to 350,000 but is narrowing at a rate of 20,000 a year. If present rates were to continue Melbourne would replace Sydney as Australia’s largest city at some point in the 2030s. The city of Melbourne is nothing if not multicultural, with dozens of different cultures and nationalities – 140 to be exact – living side-by-side. 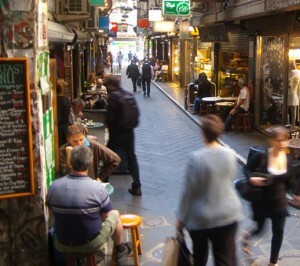 The city’s Multicultural Hub was launched as a friendly, supportive environment for Melburnians of all cultures to get together and work, share and learn, while the city’s diverse and awarded restaurant scene is highly influenced by immigrants from diverse backgrounds including Chinese, Italian, Greek and Lebanese. Decades ago, the Australian property market was dominated by demand for freestanding houses. The appetite for ‘the Australian dream’, complete with a comfortable home on a big block with a picket fence and a pet dog, was insatiable, and home buyers as well as investors flocked to houses as a preferred investment type. Today, the concept that land goes up in value is still well recognised, but not all land is created equal. What’s more, changing demographics and evolving family situations have shifted dynamics to the point where more Melbournians are trading backyards for courtyards and balconies meaning apartments, units and townhouses can be just as highly sought as freestanding homes. With median house values in Melbourne virtually doubling in the last decade, many people can’t afford freestanding homes, so they smartly start their home buying or investment journey with apartments instead. The term townhouse originally referred in British usage to the city residence of a member of the nobility, as opposed to their country estate. Today the term refers to medium density (often multi story) dwellings that may be, but not necessarily, terraced (row housing) or semi detached. In fact the 2016 Census showed an 11% increase in the number of people living in townhouses – a popular style of Melbourne accomodation where people live in modern accomodation on compact blocks of land close to ammenities in the middle ring suburbs. Yes Melbournians are trading their backyards for courtyards and balconies. Units (sometimes called villa units) is the name given to single-story, older-style dwellings, mainly built in the 1960s and 70s. Today, developers rarely build in this style because it’s not as profitable as building ‘up’. This style of property makes an attractive investment, as they are increasingly popular with small families and young tenants, who enjoy the privacy with no one above or below and the small yard. If you invest in a flat you are generally buying an apartment that has other dwellings attached to it; these could be above or below, next door, or a combination of the above. They are the preferred style of accommodation for young Melbournians and are generally easy to tenant and therefore, if well located, make great investments. As the entry costs are lower, they are also the first type of accommodation bought by many first home buyers. Commercial properties, (retail shops, factories, warehouses and office spaces) are in a very different league residential property and out of the domain of the every-day investor. Whilst there are many benefits of investing in commercial properties, they are more suitable for the sophisticated and experienced investor, particularly as they are more yield-driven than capital growth-driven. Consider it this way: for most advanced investors, your job is to build your asset base. Once your portfolio is big and robust enough, you begin transferring into a cash flow strategy and at this point, a commercial property can be a good investment. Melbourne’s inner city core has a population of around 29,450 people, a figure that is expected to double to 59,900 over the next 20 years. As a result, there is much more property development activity in Melbourne CBD than anywhere else in the larger metropolitan area, with the majority of these developments comprising of high-density high-rise apartment buildings. The area of Southbank, just south of Melbourne’s CBD, currently boasts over 9,000 distinct dwellings, the majority of which are family households (45%). The number of residential properties is set to rise to more than 26,000 over the next 20 years. Currently I’m worried by the large number of poorly built inner city apartments on the market or planned for completion. Many, in fact most, of these are being bought by overseas investors and as these are likely to become the slums of the future. Just to make things clear…I would avoid this segment of the Melbourne property market. Melbourne’s south eastern suburbs boast distinct communities, neighbourhood attributes and differing property growth cycles. However while intricate, they’re considered by many to be the best Melbourne property investment suburbs. The inner south eastern and bayside suburbs of Melbourne make great locations to invest. These include some of the most affluent areas of Melbourne – the residents of the eastern suburbs enjoy a median personal income of $1,164 per week, according to ABS figures. Around 33% of properties are owned outright or mortgaged here, with 20% of housing comprised of townhouses or semi-detached homes, and only 33% of residential properties being high-rise apartments. This is a dramatic difference from the inner city, where apartments are the dominant dwelling type. The inner eastern suburbs of Melbourne also boast some great investment locations. While the outskirts of Melbourne’s west and north is home to several of the city’s fastest-growing outer-suburban areas including Truganina, which increased by 18%, Tarneit (16%), Point Cook (12%), Melton South (11%) and Wyndham Vale (10%). However these more blue collar areas have lower average wages growth and therefore lower ability to sustain capital growth. While these areas are experiencing strong population growth and they have enjoyed strong capital growth over the last few years as the rising tide of the strong Melbourne proeprty market lifted all ships, now that the cycle has reached its mature stage, many of these locations, especially the blue collar suburbs will struggle. In general there are better investment opportunities in Melbourne’s inner eastern and south eastern suburbs. Melbourne has been named as the world’s most liveable city by the Economist Intelligence Unit’s liveability survey for 7 years in a row and for very good reason! Boasting excellent healthcare services, premium education facilities (including world-class universities), a stable and diverse economy, solid investment in infrastructure and a thriving, creative culture, it’s easy to see why Melbourne received an overall score of 97.5 out of 100. With such a high standard of living and ready access to good quality facilities and amenities, it comes as no surprise that people continue to choose to call Melbourne home. In addition, with over 120 suburbs with a median house price of over $1million, Melbourne has the second highest median price in the country (behind Sydney). Just because Melbourne has a well-deserved reputation for quality, that doesn’t mean the city is flawless – far from it. In fact, the Melbourne CBD (Central Business District) is riddled with poor quality apartments, with one report stating that an estimated 55 per cent of the city’s tallest apartment buildings are of “poor” quality, with common design flaws. No one wants to live in a sub-standard apartment, regardless of how affordable it is, and there are only so many people who would find a hotel-sized apartment appropriate for full-time living. 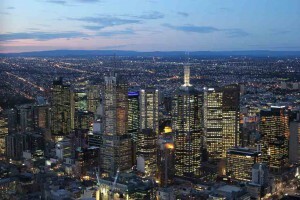 The fact that an estimated 40 per cent of apartments in Melbourne are smaller than 50 square metres, according to the Melbourne City Council’s planning department, shows just how big this issue has become – particularly when you consider that the minimum size a single bedroom apartment can be in Sydney, London and Adelaide is 50m2 or above. Not only are the apartments lacking in breathing room – literally – they’re also flawed in a number of other ways, with kitchens placed in hallways, a lack of ventilation and natural light, and poor storage. All of these design faults make these types of developments less attractive to potential tenants, which reduces the desirability of these properties. Investors would be well advised to steer clear of apartments that don’t tick all the boxes. Shoebox-sized living spaces, alongside common design flaws in the building itself, should raise some serious red flags for buyers. The problem is many overseas buyers are purchasing these properties which will become the slums of the future. 21. Look for Melbourne’s best properties in the inner and middle ring suburbs. Studies – and time – have shown that properties close to the city’s CBD (but not in it) and in bayside suburbs close to water will increase in value more quickly than other properties and suburbs. The demand for property is higher in these regions, as there is no land available for release, but the areas remain close to employment or desired locations. Not only are properties closer to the CBD closer have better access to amenities and more employment opportunities, but transport costs are often lower and, as a result, people are willing to pay a premium to live there. The end result for property investors in Melbourne is that the inner and middle ring suburbs will (generally) out-perform the averages for suburbs located further from the city. Melbourne’s property market has been typified by strong population growth and to keep up with surging housing demand, there have been a huge number of new developments – mostly in the form of high-rise apartment buildings, in and around the CBD – that have been approved. While the population growth is soaking up much of this new dwelling stock, the city is still over-supplied with too many new inner city apartments. With such a large number of development projects either completed, begun or approved in recent years, the risk for property investors in Melbourne is that there will be an oversupply of properties in and around Melbourne’s CBD. According to the ABS there were 73,290 dwellings • under construction across Vic at the end of March 2018, which was an historic high. The 73,290 is split between: a record high 23,804 new houses, an historic high 48,971 new apartments and 515 non-new dwellings. There was a significant rebound in the number of dwellings under construction across the state over the quarter with the number under construction now 7.6% higher than the previous record high. In May 2018, there were 6,435 dwellings approved for construction in Vic which was 11.8% higher over the month and 18.3% higher year-on-year. Over the month there were 3,714 houses approved for construction, an increase of 9.7% over the month and a 7.9% increase year-on-year. While unit approvals are down from their peak, the 2,721 approvals in May 2018 was 14.8% higher over the month and 36.4% higher year-on-year. Why would anyone go into a business deal to make a loss? Generally it’s because property investors in Melbourne hope that their income losses will be more than offset by their capital gains when they eventually sell (or refinance) their property. Negative gearing is not an investment strategy – it’s just the way a property is financed at a particular point in time. 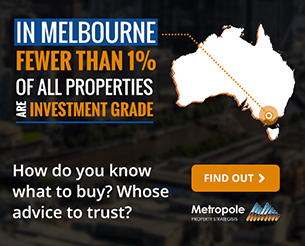 How do you choose an investment property in Melbourne? 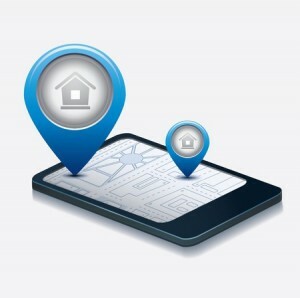 We believe that 80% of your property’s performance is related to it’s location (one that outperforms the averages ) and 20% or so is related to buying the right property in that location. In other words in an area that has a long, proven history of strong capital growth and one that is likely to continue to outperform the averages, and this is largely because of the demographics in the area and the future economic prospects for the area. There is so much information available about various property investing trends, strategies and market information that it can be overwhelming knowing where (or how) to get started. Join the 120,000-plus Australians who subscribe to my weekly newsletter, which offers a diverse range of analysis, articles and expert commentary that is essential for successful property investing. You can also sign up for my personal market updates by getting a daily dose of insightful commentary in your inbox each morning. Join here; this is free and different to our newsletter subscription. 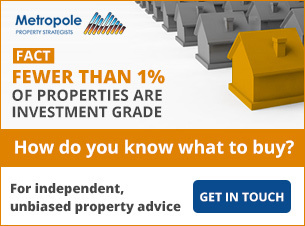 Whether you are new to property investing, or a seasoned landlord with many years of experience in the trenches, the team at Metropole would love to help you formulate an investment strategy or review of your existing portfolio, with a shared goal of helping you acquire your next A-grade investment property. We can help you take advantage of opportunities currently available in the property market, by offering independent, unbiased advice. Click here now and contact us for a complimentary, obligation-free session with one of our property strategist’s today. I am a First Home Buyer with $500-515K budget. What are your thoughts on buying a post war 2 bed apartment (one of 8 in block) in Brunswick East, VIC? It is fairly small <60 sqm and East/West facing. Should I go further out? Ruth – your budget will allow yo to buy a good property – and I like the area you’re suggesting but you’ll have to be very, very careful in selecting he right property. With so many apartments in Brunswick you need one that stands out – the one you mentioned is TOO small – don’t buy that one! Ruth internal area is one of the least important factors Ruth – yet you’re obsessing over it. I’ve seen some well designed and laid out smaller apartments work better than bigger but poorly laid out apartments. Then that’s a different story Ruth – have you considered rentvesting? It’s interesting, I saw the same trend occur in London. When Melbourne is growing exponentially, it’ll follow the same trend as any metropolitan city. Some will expand out but the professional migration will attract close-to-CBD living. I guess it’s a long game for me and my growing family living close to work and schools, especially with the sluggish infrastructure development to accommodate the number of people. I played the game when I purchased (owner-occupier not investment) in London’s Brompton Road/Hyde Park, sitting tight paid off. Thanks for the regular content and up to date info, it’s hard to find such an insightful resource online. Hi Michael, you’re blog is fantastic. I’ve just purchased a 3 bed apartment on Queens Road that over looks Albert Park Lake and the Park. It will be for owner-occupancy for a few years and waiting to see what the market will do in a few years. I know you’ve mentioned that properties close to the CBD may not be a good investment long term. The property is 172m sq. Do you think this would be a bad investment in the long term? I hear mixed opinions about Melbourne 3004 properties. Sabrina – congratulations on your purchase. You now have what’s called buyer’s remorse. I’m a first home buyer wanting to buy two properties; one an investment property and the other our first home in inner Melbourne and surrounding suburbs. I’ve done a lot of research on the housing market and potential growth areas, but feel unsure where to invest and if buying a house and land package in a potential growth area would be wiser or an existing property. What are your thoughts on this and the current market and what criteria do you base your investment decisions on? Tiana – we base our recommendations to our clients on significant research and years of data – but most importantly the experience and perspective to interpret it correctly. Steer clear of the house and land packages – reports suggest over 20% of these purchasers are likely to default because of finance issues – and that will create chaos. What are your thoughts on Windsor as a suburb? I’m looking to potentially buy my first apartment off the plan. It’s a 1 bedroom, 1 bath, 1 car park for approx $500k, what are your thoughts on the area? Would you recommend flatly not buying off the plan or think a severe price reduction is in more in line? What do you think of Frankston and Frankston South houses market over next 2 to 3 years? Thanks for your great insights. Alex – those suburbs are definitely NOT on my radar. For the 40+ years I’ve been investing in Melbourne these suburbs have underperformed, despite the significant local infrastructure. Your 29 property investment tips are rich food for thought when considering buying a property for investment. I am presently thinking of buying a 1 bedroom apartment (around $400k) in South Melbourne. It is one of many apartments in a block built in the 1970s – in a garden setting. Seems to have the X-factor. It has the advantages of city life but without the feeling of city crowdedness. Would this property be on your shortlist? Kitty – I can’t give specific advice about that property without knowing it – but I would NOT buy a 1 bedroom established apartment in South Melbourne – there are too many new apartments in the vicinity and more to come. I just found this website and it’s fantastic! I am looking at buying my first property for around $840k. I have seen a beautiful 2 bedroom art deco apartment in Thackeray Street in Elwood. It is one of four, has a tiny study and a beautiful courtyard. The apartment itself is 78sqm, and the courtyard is around 30sqm. In your opinion is this a sound investment for under $840k? Or am I better off to go a bit further out and try and buy a house in.. say Hampton? Isabelle – that’s a great budget, and I really love Elwood, I own two apartment buildings there. 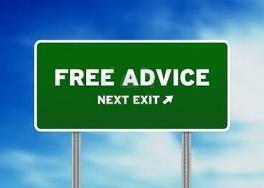 Of courseI can’t give you specific advice online. It would be wrong to do so not knowing your strategy, needs, Cash flows,Timeframes and risk profile. 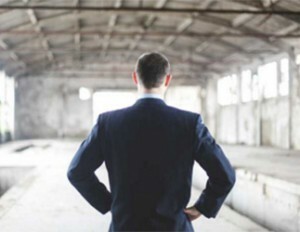 Property investing is as much about you as it is the property. Recently just bought a new little 2 bed 2 bath unit in abbotsford $550. Boutique block of 16 units. Total of 72 m2. On the small side but is their potential for future growth in this area and for a smaller unit? Sorry you asked so I’ll answer honestly. These are the questions you should have asked before you bought. I know Abbotsford is close to the CBD but it has exhibited minimal growth due to the large oversupply and is likely to continue to underperform. Abbotsford is not on our radar. As for the property itself, to be an investment grade property it needs to be unique or have a level of scarcity. 72 sm mts is on the small side, but I’ve seen worse. My young daughter wants to purchase an apartment in a good Melbourne suburb close to the city for around $300,000 is that possible? The apartment will be an investment property due to her living in Sydney. Is it possible to get in with around 5% deposit after stamp duty and associated costs? She has no debt except a student loan. Rana – you will not get an investment grade property in Melbourne at that price – not even a 1 bedroom apartment – you’re 5 years too late. Found this article very useful and informative as someone that is new to this area and is wanting to get a better grasp of property investment. With today’s current issues around banks being tighter with lending, it now adds to the already problem that young investors face with trying to buy a property, let alone an investment property. Due to the laws around first home buyers, if I was to buy an investment property I would lose out on all the bonuses which the government offer as I would be looking to rent out the property as soon as possible and not moving in. Is it worth buying a property with the grant and paying the mortgage for the first 6 months and then renting it out, but that would be expensive and require buyers to have even greater income. The next issue as borrowing power is reduced for young investors, our buying power takes quite a considerable hit. Is it worth buying out in further suburbs where we could afford but will face the issues you discussed. Compared to waiting and building up greater deposit/ earn a higher level of income to then buy into a better area? So my question is what would your recommendation be to a young investor that is trying to get into this market but faces these challenges? I wish I would had read this article 6 months before I took the decision to invest in one of the land and house package sort of venture in Melton South and my decision would had been different. I am a first time investor with 50K to 60K funds in handy and I had entered into land and house package at Melton South where the total value comes to 460K plus applicable stamp duty etc., The land is coming for settlement during second quarter of 2019. Now after reading your article, am wondering whether I had made the right decision to invest in Melton South, especially after reading your article that capital growth would be less in this area. However I observed that for each phase of land release in this land estate they are increasing the price by 10000 to 15000 ad am not sure does it represent a genuine growth. I booked in 8th release and they have still another 6 to 7 releases planned till 2020, so am wondering can I be assured of this 10000 per each release growth at a minimum assured and wondering in real terms what kind of equity I can build over next two years. Am from Sydney and in order to fulfil my dream of buying a decent 750k to 800K worth of home, I am trying to build some equity and as a first step I invested in Melton South. So wondering, whether this property gives me decent equity in 2 years from now. Also am aware Melton South increased by 35% in the last 12 months[I observed in CBA’s Property insights for suburbs] and worrying I booked this property at the peak of the growth cycle. Appreciate your advise in this regard, so perhaps before land settlement I can exit this property[Assuming I could find a buyer]. I have 2 investment Properties in Footscray ang Thornbury for 2 years.Most of the investment grade properties are more than 1 million easily ,what do you think which area ideal for a novice investor like me ?should I stick to Eastern and South Eastern suburbs? They are both good suburbs, but not every property in the better suburbs makes a good investment. And you’re wrong that “investment grade properties cost over $1million. In the last months we’ve bought some great villa units with a significant land component for $700,000+ And we’ve en bought 3 different 1 bedroom apartments each with their own courtyards for around $400,000 – all in good south eastern suburbs. Your budget will be set by the banks, so concentrate on buying in the best suburb you can afford and then get the right property in that suburb. Great article that is enlightening! My wife and I are seriously considering to buy in Melbourne our second investment property. We have been advised and proposed by an investment managers, an of the plans apartment in Heidelberg. As you mentioned, there is a premium for brand new flats and I am a little put off by it. Also the fact that this will be rented only in 10 month…. I’m so glad you asked – because an “investment manager” is really a salesman for a developer – otherwise the would give you choices. Wish all in property market a prosperous 2018. What’s your thoughts on Clayton suburb compared to other SE suburbs. Being close to Monash Uni and Medical centre, do you see an uptake and increase in capital growth. Is the vacancy rate high in their? The developers in Clayton are driving the prices up like crazy. Check out some of the recent sales and you’ll change your mind. Things are moving high and fast. It is so great to read your blog. I am an Aussie currently working oversea for some years. At the moment, I and my wife are planning to invest to the Australian property market. Our budget is nearly $1.000.000. Our plan is to invest in either an old detached house, terraced house or a new townhouse, which are popular in our major cities. The desired location is within 5km from the CBD with close distance to public transport and amenities. We feel that with this budget and requirements, Sydney is out of our catch and it may be possible for us to invest in Brisbane or hopefully Melbourne. 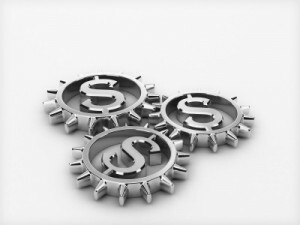 Our target is to get about $700 per week (after all taxes and fees) and a capital growth of minimum 5% annually. How feasible do you think our plan is? Do you think we should pay attention to both cities or just stick to Brisbane or Melbourne? I know you suggest the South Eastern, Eastern and bay side areas in Melbourne, but what about Brisbane suburbs (like New Farm, Spring Hill, Highgate Hill, East Brisbane, etc…? It would be so great to hear from you. Thank you very much. You’ve got a great budget which will give you a heap of options – but my thoughts about where you should invest and in what type of property will depend on your cashflow requirements and your strategy and end goals. In today’s competitive market, you are up against professional buyers who do this day in and day out. Make sure you have done your due diligence carefully and then get someone on the ground to help you, because if you fail to prepare then you are most likely preparing yourself for failure. We are preparing the budget as well as the investment plan in more detail. We hope to have Metropole on our side soon. I have been following your blog and also recently podcasts. 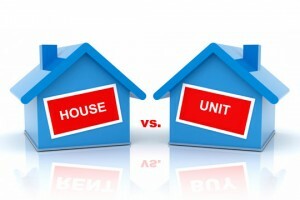 I must say in the last 10 years of my interest in Real Estate, the facts and strategies you are sharing are mind boggling (I say that by comparing the quality with other high fliers!). I have been relatively ok by following your strategies. Please continue this forever! I have a question on the factors which are evolving in and around Melbourne. 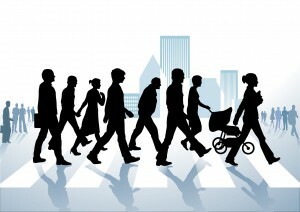 What is your view about the six new employment clusters planned under Melbourne 2050 plan? Why wouldn’t the suburbs around these clusters grow such as South Dandenong and Werribee. I am aware that these areas are not in your preferred list. However, the demographics are changing now. There are opportunities in these areas to develop (buy and subdivide) and manufacture capital growth. Wouldn’t these suit an investor like me with a 10-15 year view and a limited budget of 500k for Melbourne? Thanks for the kind words. No doubt we are going to have to decentralise to a degree and their will be employment nodes around the periphery. However if you look at how other large global cities have evolved, and Melbourne is a global city which will have 5 million residents sooner than we all expected, the highest priced land and the best long term growth is in the inner and middle ring suburbs where the affluent people want to live and where the can afford to and are prepared to pay to live. Would there be anything available for less than 500k and manufacture capital growth in the inner and middle ring suburbs? Frankly, the inner and middle ring suburbs were my first preference. However, at this stage of market cycle, I couldn’t find opportunities where I could manufacture capital growth with reasonable negative gearing. I am at stage one of the property investing building my asset base. Would be great to hear your comments and guidance on this. We bought 8 of them last month for our clients – that’s what we specialise in – in fact 6 were off market – you would have never known about them. My husband and I are interested in purchasing an investment property in either Footsgrey of West Melbourne. We were looking at buying off the plan but now i’m hesitant. What are your thoughts on a 1 bedroom new unit in Footsgrey for around $350,000 (off the plan)? Also, what suburb would you recommend for around the $350,000 price range. A friend recommended Epping, what are your thoughts. This is an investment only, we will not be living in the property. I’m so glad you asked Morgan. Hopefully my reply will save you heaps of money and stress. AVOID off the plan!! Its a sure way of losing money in this market. Check out this site for off the plan and learn why. And definitely steer clear of Epping. Working out of South Yarra, I couldn’t agree more with Point 22 – There is so much oversupply in these areas and over the next couple of years there are going to be dozens of 100+ apartment complexes shooting up. My focus is on Point 21 – Every second street in these inner and middle ring suburbs has one or two townhouses replacing an old home. The profits these property developers are making is unreal! Home owners need to educate themselves and take a slice of that pie! Looking to purchase a townhouse (3 beds) in Reservoir, on Purinuan RD (close to Cheddar road). Initially to live in and then to make it an investment property. Would you be able to advise on the area and its growth? I’m sorry but I don’t give advice on the internet about specific properties or suburbs – that would be dangerous without knowing your circumstances. However that’s what the team at Metropole specialise in. They help not only investors but also home buyers. Hi Michael! Great read .. Been wanting to upgrade to a house and debating between West Footscray and Deer Park/Derrimut area. West Footscray u get an average size house for almost a million while in the latter u get a massive house for around 600k. Which do you think is a better place to purchase? It sounds like you’re talking about upgrading your home, rather than buying an investment. If so where you buy will be dictated by your budget and lifestyle and family needs. Deer Park / Derrimut will always be cheaper than West Footscray – it won’t catch up – the gap will always remain. 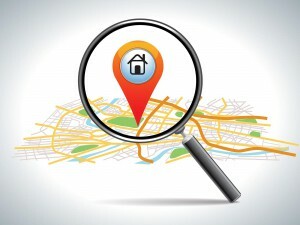 In both suburbs there are good parts, better locations and some places where you wouldn’t buy, so its not as simple as saying one is better than the other and then in each location there are some proeprties that will grow in value better than others – yes property decisions are difficult aren’t they? Micheal, interesting information, thanks for the read! We are in the process of purchasing a two bed, ground floor apartment with outdoor living space in Brunswick East as a long term investment for 610K, are we mad? The apartment is developed by the caydon property group and on face value appears to have the x factor. Our apartment will front Barkly St. If you’re considering buying a new or off the plan apartment in Melbourne and esp in Brunswick – STOP and read all the info about the huge looimng oversupply and minimal or no capital and rental growth for a decade or more. Thanks for the commentary Michael. I am trying to educate myself about the pros and cons of certain types of investments. In your expert opinion, in the long term, would a stand-alone town house in South Yarra be better than an attached newly renovated and landscaped townhouse in Malvern? While I will live in the property, I am willing to choose the location/property that will appreciate more over time. Both walking distance from shops, public transport and off street parking. Michelle they are both great locations and should give you long term capital growth for townhouses, but I’d avoid apartments in South Yarra. Working out of South Yarra, I couldn’t agree more with Point 22 – There is so much oversupply in these areas and over the next couple of years there are going to be dozens of 100+ apartment complexes shooting up. My focus is on Point 21 – Every second street in these inner and middle ring suburbs has one or two townhouses replacing an old home. The profits these property developers are making is unreal! Homeowners need to educate themselves and take a slice of that pie! Hi, I’m looking at more spacious apartments in St Kilda with something unique about them such as a roof top terrace. My concern is that in 10 years, many of these don’t seem to have grown more than 15-20% outside of inflation while miniature houses in the same area have gone up more than 50% outside inflation. I am having difficulty understanding why more spacious, better quality apartments would still have poor growth? Could this be because of the constant supply of new comparable apartments in St Kilda? Do you think their prices would only start to rise when most houses have been converted, and there is no more space for conversions to townhouses / apartments? Your thoughts are greatly appreciated. St Kilda is a great area, but there are some segments of St Kilda that have outperformed others, and some apartments are more popular than others and have stronger capital growth. A roof terrace would not be high on my list of characteristics of an investment grade apartment. Over the last few years, houses of outperformed apartments in St Kilda, because they are in short supply,and they are is highly sought after by owner occupiers – but they are out of the budget range of most investors. I often get asked about specific properties or locations and I don’t like responding as I don’t know enough about you and wouldn’t want to mislead you. I don’t know your plans, your risk profile, what else you own etc. Hughesdale is a good area but not all streets in the suburb are “A” class streets and many proeprties are not investment grade. have owned a 2 b’room flat in a block of 10,(2 story building) in glen iris,overlooking Gardiner park and near the new Burke Rd train station since 2011.have noticed in that time that the house market has been going really well, however unit market hasn’t had much movement at all.it is surrounded by all the old cal bungs etc, and i was expecting more growth than what has occurred.Am interested on your thoughts of the area,as i have been pondering on maybe selling out of the area and heading down the beach bay side area that you are keen on. I have no issue with Glen Iris – but of course that is too broad – there’s areas there I would avoid. but in general Glen Iris is a good location and your apartment should have increased in value. You had mentioned to stay clear of oversupply apartments in Southbank and referred to them as slums. My question is – why are the developers focusing on these areas knowing that these will not be good investment vehicles? Are these houses built for buyers to stay only? I remembered during the period before the housing bubble burst in US, developers just need to find another fool bigger than themselves to sell off their stocks. Is this a similar situation here? You’re right – the developers are after short term – one off – trading profits. They try and fit as many apartments as they can on the block and make money – that’s their job and that’s OK.
Great article. I was just wondering what areas you would recommend buying in… My partner and I are first home buys, looking to spend around 450,000-500,000 for a 3 bedroom home, planning to starting a family so will be living there potentially the next 10+ years. We both are in the northern suburbs currently and are unsure what areas to start looking at. Any help or recommendation would be greatly appreciated. Bree – good with this house hunting, it’s not easy finding your first home and clearly it is a substantial investment for you. This is important to put investor cap and not let your emotions rule too much. When looking for a home you’ll use different criteria like proximity to your work, schools interest, and be wary in some of the northern suburbs where unemployment is high the demographics suggests wages won’t grow holding back capital growth. I’m planning to buy 2 bedroom apartment as an investment in Melbourne CBD for under $300k and rental return is slightly higher than repayments. Its not one of those self serviced, non owner occupying apartments. I’m also a first home buyer. Would like to hear your thoughts on this? Have been following your daily commentary for a few months and find it very useful . I have invested in a 2 bedder apartment in south melbourne. It is a small development about 45 units and I bought it of the plan. I bought it because it is a small development and is near CBD. I also heard there is a lot going in in that area – fisherman bend. A lot of jobs going to be created. Do you see any potential in this area? I know you are not in favour of buying of the plan . I don’t know your property, it’s location or the price you paid, so I can’t really give you an opinion about your specific property. It’s good that you’re in a smaller block, but the location is one I’m concerned about. Too much oversupply and I don’t see Fisherman’s Bend as a positive – the huge supply will limit you capital growth for years. Excellent analysis. I recently bought a house (1 of 2 on the block) in Ringwood East in outer East Melbourne for 551,000. It’s close to the station & in Ringwood secondary zone. It is one of the better schools where you can still buy under a million. Good buy? What are your thoughts? I don’t really know Ringwood is a good area, but a bit far out for my strategy. having said that it’s performed extremely well lately. I am considering to buy an 1 bedroom luxurious apartment (off plan) for $498000 in Brunswick/ Victoria street with 6% rental guarantee for 3 years. How much growth in the next 10 years can I expect for this property according to the previous market growth in Melbourne? The vendor said it would be double in price after 10 years but would that be applicable for a 1 bedroom luxurious apartment ? Amy – please don’t do that – have you read my blogs about off the plan purchases? And those of almost every other independent advisor. Michael, thanks for the interesting read. We have just recently been looking at upmarket apartments in St Kilda Rd., off the plan. Seems like not your recommended course of action on two counts. However, these don’t seem the types of places ever to become slums but will all apartments be tarred with the same brush come the time of oversupply? Also, this would be our ppor and not an investment property and wondering if that makes it any less a dumb idea to pursue? Dan – obviously the criteria are different for your own residence as opposed to an investment property. Think I might give your office a ring. Do you think it’s good investment around Point cook, Sea meadows and Altona Meadows ? Where would you recommend to invest? Which area or suburb? I am from Sydney so i don’t have much idea about Melb. Connor I would definitely avoid of the plan and I explain why. I definitely know what you mean in these articles. Lets say 3 bed apartment in footacray with perfect city views 2 baths 2 carparks 100m2 is currently selling for 670k by developer but i can buy from nomination sale for 610k even though original purchaser bought for 580k at first release. So i am buying the property less than what developer is asking now so even if they place comes in a little under valued i only payed just over 600k so i think im in a safe position unless the apartments are 100k over priced feom the beginning but i cant see this with a good m2 value for size and un interrupted city views. Footscray has underperformed the Melbourne averages fot the last 50 years – why should things change now? Thanks for sharing. Do you think it’s good investment in Williams Landing? Thanks. I don’t know your circumstances and I don’t know the property you have in mind – but the simple answer is William’s landing would definitely NOT be on my list of places to invest. I have recently bought a lot of size 448sqmts at woodlea suburb in stage 11 for 200k near rockbank in the land release. Looking at the news about melbourne property market I am little hesitant on whether I did a right decission. Could you please review and would be thankful if you can advise me on my property purchase. Thanks for the great read Michael. I’m just a bit worried now, as i have just invested in a new house and land package in Melton South. I knew it had a slow growth but thought it was still a good investment because it was way under $300,000. Do you think it was a bad idea? Your opinion would help a lot! I’ve just been updating one of my books, so looked at the performance of Melton over the last 40 years. I love your articles and I had met with your strategist a few years ago but I regretted not taking action to purchase another property at that time due to fear. 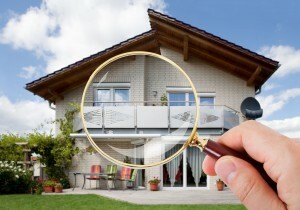 I know the exact property you’re looking it becuase an owner occupier asked us to look at it for them as a home. Interesting comments and thank you for sharing. What do you expect annual market price for the Melbourne market for units, houses to be over the next 5 years. One expert believes that property market will continue to boom for the next 13 years . Sorry to say – it won’t boom for 13 years – the proeprty market cycles. I am looking to buy investment property in Melbourne. My budget is 450k at 90% LVR. The suburb you recommend seems to be pricey for my budget. Can you help me or will I be better off with someone who is used to work in that type of budget (probably working in outer north or western suburb).I would also like to know your fees(charge)? it seems finding right buyers agent is more difficult then finding right property……. 3. The type of property you buy – this means you may need to buy an esatblished apartment – still evry doable in your budget. You ask how much our fees would cost you, a better question could be – can you afford to pay a “learning fee” to the market by getting it worng like many beginning invetsors do? Especially at this more mature stage of the proeprty cycle. By the way…we’re much, much more than buyers agents. We don’t just take orders like many other buyers agents. As property investment strategists, we formaulate a long term strategy and tehn help you implement it, then reguallry review your progress. We build relationships. “Many, in fact most, of these are being bought by overseas investors and as these are likely to become the slums of the future. I would avoid this segment of the Melbourne property market”. As I already have an unit of Nova (Elizabeth Street) since 2001 and Art On the Park (Williams) since 2013, do you suggest I sell them on keep it for further observation. Your advice is greatly appreciated, thanks. I’m a real estate agent based in the melbourne CBD. Would you like a free market appraisal for your Nova and Ark on the Park apartments? Agreed with what Michael said about the city apartments. This was a wonderful overview and thankfully confirms a lot of my research so far. Thank you! 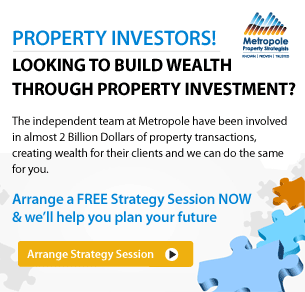 It’s hard enough for locals to get property selection right, so I believe you should get a property strategist on your side – but of course I’m biased – however my team at Metropole would love to help you. click here and organise an obligation free chat. Will you been doing a similar article on Brisbane? I am keen on investing in Melbourne but the buying frenzy is putting me off at the moment. Just waiting for the buyer’s market to take place..
It’s just I don’t want to get caught with the forces we’re waiting to happen. Firstly, the downturn on the market which I’m sure will eventually come so as the interest rate rise. And then theres a talk about abolishing the negative gearing in which slowly will take place.. Correct me if I’m wrong but those forces favour the buyers. At the moment, I think, a $100k down payment will still be a negative geared property in a desirable areas in Melbourne even at this low interest rate environment. In the long term the underground station will be a big plus for your location, but you’re right that in the short term it will be a nuisance. However more important to the performance of your investment will be the oversupply of apartments, not only in your immediate vicinity. but in the CBD. Thank you for this article. Found it comprehensive & helpful. I’m a foreigner looking to invest in Melbourne. Hi Michael, thanks for the article. I’m a foreigner and planning to invest 4 bedroom house in West Werribee close to Riverwalk estate, really appreciate if you could give me some inside thought in that area. Thanks for leaving your question. I understand as a non resident your options are restricted but Werribee is definitely not on my radar. It is definietley not an investment grade area, having always underperformed the averages.